Season 2 of the HBO television series Treme just came to a close, and was renewed for a third season. While one might say that an ongoing theme in Season 1 was immediate recovery and adjustment for the city of New Orleans immediately following Hurricane Katrina, and Season 2 examined issues with violence and corruption a year later, music remained a vibrant focal point throughout. Far from simply offering an enjoyable soundtrack, Season 2 of Treme shows the overwhelming importance of music in New Orleans on a variety of levels. Keeping with the mission in the first season, Treme continues to use New Orleans musicians as reoccurring characters playing themselves, in venues they might normally be found, as well as great cameo appearances from jazz and folk superstars. Season 2 featured musical highlights including scenes and performances by NOLA locals and non-locals, including Dr. John, Donald Harrison, Henry Butler, Kermit Ruffins, the Hot 8 Brass Band, Galactic, Dirty Dozen Brass Band, Dr. Lonnie Smith, Ron Carter, John Hiatt and Shawn Colvin. These performances and appearances were not only entertaining, but keep in stride with the attempts of the program to offer a certain element of “real”. 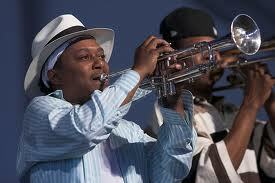 Kermit Ruffins is regularly found leading groups in NOLA bars and clubs to packed crowds. Donald Harrison is recruited late in the season to perform on a record designed to mix modern jazz with the sounds of Mardi Gras Indians. As KPLU’s Robin Lloyd pointed out to me, this is very appropriate for Harrison. He is the Big Chief of the Congo Nation Afro-New Orleans Cultural Group which keeps alive the secret traditions of Congo Square, but has also spent a great deal of time being involved in everything from smooth jazz to hip-hop. In the Season 2 finale, hope was offered after a tumultuous season, where Jazz Fest takes center stage, and the program closes out with an emotional montage set to the Louis Armstrong recording of Wrap Your Troubles in Dreams. While the close of Season 2 suggests more optimism than the finale of Season 1 did, several elements of pain and struggle to come for the city of New Orleans in Season 3 are indicated. No doubt that it will be set to the wonderful sounds and music of a city that continues to struggle in recovery. I love this series, season 1 was fantastic! I am greatful that you taking a period to evaluation my information. This is one of the largest ATM networks in the country. wish to complete his or her house loans more quickly. and the repayment programs can also be longer. Generally loans will include extra fees in addition with interest charged. Property condition must be acceptable to the NACA lenders. Lending is relatively simple, with a lot of companies that, in order to receive it possible. By guided by these methods and learn how to calculate your loan payments for mortgage loans so you can discern your monthly billing statements. What’s up it’s me, I am also visiting this web site daily, this web page is actually nice and the viewers are truly sharing good thoughts. It’s hard to find your posts in google. I found it on 21 spot, you should build quality backlinks , it will help you to get more visitors. Your favorite reason appeared to be at the internet the easiest thing to consider of.